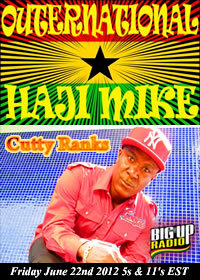 Dancehall giant Cutty Ranks is the special guest on this weeks OUTERNATIONAL roots reggae show on BigUpRadio.com. The roots reggae weekly show “Outernational” is hosted by Haji Mike. The Outernational airs every Friday on Big Up Radio’s roots reggae station. The show airs at 5am, 11am, 5pm and 11pm EST. Haji Mike is a world class reggae DJ and will bringing the nothing but the best of roots, culture and special appearances from reggae artists. Catch this exclusive interview with the world renowned dancehall reggae artist Cutty Ranks! In one way or another, Haji Mike has been involved with reggae music since the late 1970′s as a DJ on radio, in the dance, as a specialist scribe for various magazines and on the mic poet/MC. His first experience of radio was in 1980 when he started a roots reggae show on Radio Essex while at University. On returning to Cyprus in the mid 1990′s after living in London for 30 years Haji Mike became a household name through a unique hybrid of JA dancehall riddims, Cypriot traditional melodies and London Gringlish chatting. Resulting in hosting a variety of TV and Radio shows in the local media. Simultaneously he completed a PhD in Cultural Studies leading to working an as an academic at The University of Nicosia. OuterNational initially began as a podcast at www.soundclick.com featuring rare cassette interview sessions recorded for various magazines in the 80′s and 90′s with reggae legends such as Burning Spear and Cutty Ranks through a cutting edge style called ‘Dub-U-Mentary’. More recently this was transformed following a return to radio via Astra and the only radio show in Greek worldwide dedicated to reggae music. As a poet/MC Haji Mike has been releasing material since 1990. Collaborations include works with Izit, Standout Selector, Zeki Ali, Rocker T, Imiskoubria, Bandulu Dub, Jah Billah, Sonic Crime & Muttley.